Oscar-Claude Monet is born in Paris. The family moves to Le Havre. At the age of 18, Monet meets the landscape painter Eugène Boudin who encourages him to start painting. One of his first landscape paintings is shown in a municipal exhibition of Le Havre. Monet decides to become a painter. Monet moves to Paris and gets in touch with various artists. Monet joins the independent Académie Suisse and visits exhibitions of the Barbizon painters. Monet is called up for seven years of military service which he breaks off after one year, however, on account of typhoid fever. Monet returns to Le Havre to recover. There, he meets the Dutch marine painter Johan Barthold Jongkind with whom he does outdoor landscape studies. At the request of his aunt, who supports him financially, Monet continues his education as a painter in the studio of Charles Gleyre in Paris, where his future fellow Impressionist painters Pierre-Auguste Renoir, Frédéric Bazille and Alfred Sisley are also enrolled. In addition to their studies in Gleyres studio, Monet and Bazille visit the forest of Fontainebleau and the Norman coast to paint out in the open. After Gleyres studio is closed down, Monet continues his landscape studies on his own; his family, who would rather have him work in the studio of a renowned painter, threatens to stop supporting him financially. For the first time, Monet asks his friend Bazille for money, as he often does in the years to come. Monet and Bazille occupy a joint studio in Paris. Monet shows two maritime paintings in the Salon; encouraged by the positive reviews, he ambitiously starts a large-format figurative painting, The Picnic. Here, he is first reported to have met Camille Doncieux who works as a model for the painting, together with Bazille. 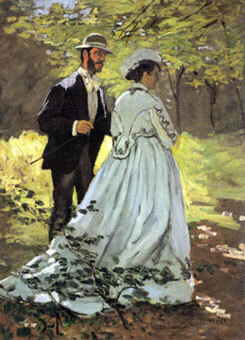 The Picnic is not completed in time for the Salon, so Monet paints the life-sized portrait Camille. 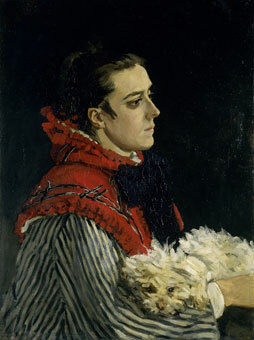 The critics praise the painting; for many, it calls to mind the works of Edouard Manet. On account of his great success in the Salon, Monets relatives continue to back him for a while, so he is able to paint without financial worries in the summer of 1866. In Ville dAvray near Paris, he does the large-format figurative painting Women in the Garden, for which Camille again works as a model. Once again, Monet is in financial straits: his family refuses to support him any longer, and the painting Women in the Garden is rejected by the jury of the Salon. In spring, it turns out that Camille is expecting a child. The numerous pleas for help Monet sends to Bazille give evidence of how hopeless his situation is. On 8 August, Camille gives birth to their son Jean-Armand-Claude, in presence of Monet. After a cold winter in Paris which is clouded by poverty, Monet and Camille move to the countryside in spring 1868: first to Bennecourt, then to Le Havre. There, five works of Monet are shown in the International Marine Exhibition, and the artist is awarded a silver medal. 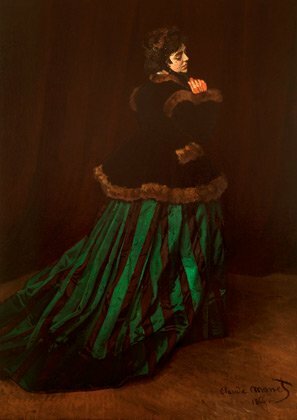 Monet finds an admirer in Louis-Joachim Gaudibert who supports him by ordering paintings (including the Portrait of Madame Gaudibert) and by giving him money. 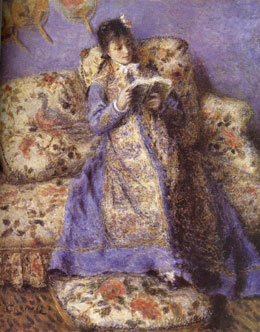 Arsène Houssaye, the editor of the magazine LArtiste, buys the painting Camille for 800 Francs. Again, Monets paintings are rejected by the jury of the Salon. He displays a highly disputed maritime painting in the shop window of the paint seller Latouche. Together with Renoir, he paints La Grenouillère, a popular restaurant and bathing resort near Paris. Here, they develop the artistic language of Impressionism with its short, fine brushstrokes which represent the shimmering light on the water. On 28 June, Monet and Camille marry. 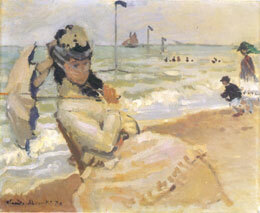 They spend the summer in Trouville where Monet develops a series of studies with Camille at the beach. The war between Germany and France forces Monet to leave for London, into exile, in autumn. There, he meets the art dealer Paul Durand-Ruel. Durand-Ruel purchases paintings by Monet for the first time. The family travels to Holland and spends the summer in Zaandam. At the end of the year, Monet and his family move to Argenteuil where they rent a house with a studio near the Seine River. Thanks mainly to the acquisitions of Durand-Ruel, Monet is free to work in Argenteuil with no worries. In spring, he does a series of paintings in his sunny garden; Camille and others are painted under flowering trees. 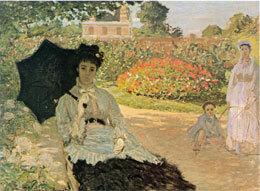 In spring and summer, Monet paints the garden of his house with Camille and Jean several times. In April, he meets Pissarro and Sisley to discuss the founding of an artists association which could organise its own exhibitions. The Société anonyme coopérative dartistes is founded on 27 December. The opening of the exhibition of the Société anonyme coopérative dartistes takes place on 15 April. Among other works, Monet shows his Impression: Sunrise which makes the critic Louis Leroy coin the catchword of an Exposition des Impressionnistes which is meant in a disparaging sense: the name Impressionists is now born. This summer, Monet paints Camille over and over again, often together with their son Jean. For the first time since 1868, Monet shows her on two large figure paintings: The Walk. Woman with a Parasol and Camille Monet in Japanese Costume. Again, Monet is in financial difficulties; the proceeds from his paintings have dropped and cannot cover the rising demands of the family. One of the persons who support him is the collector Ernest Hoschedé; from July to December, Monet works in his Château de Rottembourg in Montgeron. It is not sure whether he already has an affair with Hoschedés wife Alice then, whom he marries 13 years after Camilles death. Camilles health deteriorates on account of a second pregnancy. In this year, Monet mostly works in Paris; only a few paintings are done in Argenteuil. Only once does he paint Camille, in Camille with a Bouquet of Violets. It is the last painting of Camille alive. On 17 March, his second son, Michel Monet, is born. In late summer, the family moves to Vétheuil, a small town on the Seine River near Paris. They share a house with the Hoschedés who have declared bankruptcy. On 5 September 1879, Camille Doncieux dies of pelvic cancer at the age of 32. 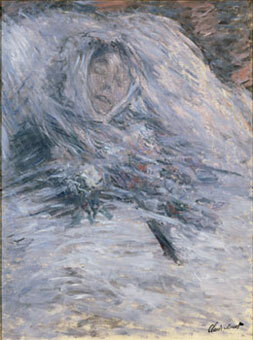 Monet paints her one last time: Camille on her Deathbed. Camilles death marks an emotional and economic depression in the life of Monet. In the following years, the situation of the artist gradually improves. Durand-Ruel backs Monet by regularly buying paintings and organising exhibitions. After the death of Camille, Monet and his two sons continue to live with Alice Hoschedé and her children. In 1883, they rent a house in Giverny where Monet stays for the rest of his life. He increasingly concentrates on his now famous garden as his favourite subject: in 1897, he does the first paintings of water lilies. In 1890, Monet purchases the house in Giverny. Two years later, he marries Alice Hoschedé. A. Cauderlier, 38 route de Giverny 27200 Vernon France, Editor.